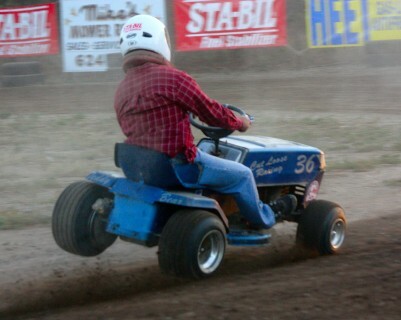 The Jo-Mow lawnmower racing club was started late in the summer of 2011 , We have hosted 2 meet and greet and open track sessions so far and have had racers and fans come from as far as 200 miles away to attend . Our track and grounds are still under construction but that has'nt prevented the racers from putting on some good shows for the fans . At our last meet on Sept 11th over 100 people attended and were treated to some real wheel to wheel racing. We served up free hot dogs off the grill with potato salad, baked beans, chips and cold sodas and met with people from all over the area . The racers were kept busy shaking hands , showing off their racers and answering questions . I think they even signed a few autographs . Cameras were busy all around and everyone was asking "when is the next race"
I know I sure had a ton of fun and cant wait for the next race .